As a contact centre manager you will have a huge range of activities to engage in, decisions to make and data to make sense of. So, it’s critical that you have a good range of metrics that you can use to measure the effectiveness of the contact centre. In reality, while it is important to measure a wide range of metrics, to effectively manage it, it is essential that you choose a manageable number of metrics as KPIs. This article provides a list detailing many of the most useful metrics to measure the different elements of contact centre success. However, it is important to choose metrics which will be sufficient to measure all the key activities of your contact centre. Using a Contact Centre Measurement Model will help to ensure that you are measuring broadly enough. Call Service Level. 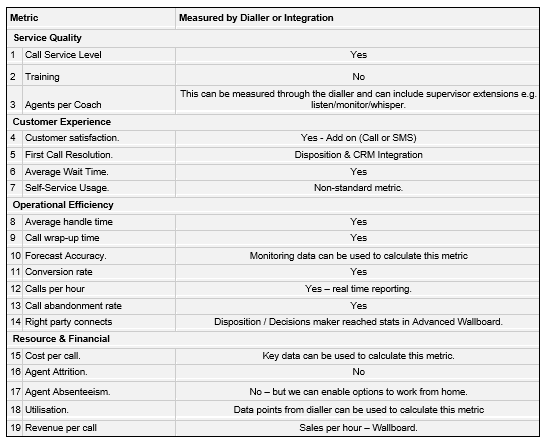 These are goals based on, for example, what percentage of calls are answered within a particular length time. Training. Maintaining a high quality contact centre is based largely on the skills and abilities of agents. Ensuring that agents get regular appropriate training to maintain and extend their skills is a good indicator of long term contact centre health. Agents per coach. This deceptively simply metric in fact can be a powerful metric that impacts a number of other metrics (Training, agent absenteeism, agent attrition). Customer satisfaction. This measures how satisfied a customer is with their interaction with the contact centre. This can be achieved with customer surveys of varying complexity. A very simple one captures it in three questions: 1. why did you contact us? 2. Did you achieve your goal? 3. Why? / Why not? Another popular one is using Net Promoter. This can benchmark customer attitudes over time. Average Wait Time. This metric tracks how long it takes before a customer is connected to an agent and it is close to most customer’s hearts. This is an important metric that needs to be measured but this may not be a KPI. Self-Service Usage. Customers can be directed towards other resources (primarily website FAQs, how to videos etc.) as an alternative way of resolving their query. This can be done through announcements to the customer as when they call or communicate. However, it is important that the website resources are sufficiently comprehensive as otherwise customers will feel that they are being given the brush off. Self-service options can work more effectively in web chat situations where a customer's’ words can be analysed and suitable resources can be presented to them. Average handle time. This metric measures the time that a customer spends from their initial contact until their issue is resolved. This is total of the time that they have to wait plus the time with the agent. Call wrap-up time. This measures the amount of time taken by the agent, after the contact has ended, to complete any administration tasks related to the call. Many contact centres have strict limits on the amount of time that an agent can spend on this task before they are available for customer contacts. Forecast Accuracy. This is a catch all metric that looks at how closely the staffing levels of the contact centre matched the changes in traffic across the day or over longer periods. The problem with this metric is that it is, generally, good at mapping predictable changes in traffic volumes. What can be difficult here is understanding whether a significant change in this metric indicates a special event or improvement / deterioration in service quality. To use this metric effectively is likely to require a good understanding of statistical methods. Conversion rate: percentage of successful calls. This is an outbound call metric which tracks how many calls resulted in a desired outcome (e.g. sale, money collected, donation made). This is a favourite metric for many call centres that are revenue driven and is often used as a competitive tool for agent motivation. Calls per hour. Another outbound metric which measures the number of calls an agent makes per hour. This can help the call centre manager to understand how effectively agents are performing. Call abandonment rate (Outbound). This is a metric that all outbound contact centres need to keep a close eye on, as it is a legal requirement to keep this as low as possible. There is no acceptable level of abandoned calls and OfCOM will pursue persistent offenders. Hostcomm recommends that outbound diallers keep abandoned call rates below 3% at all times (not simply an average of 3%). Right party connects (Outbound). This measures the percentage of calls that actually reach a customer. While this is a desirable metric to improve. The quality of data can be a major influence this metric. Cost per call. Monitoring contact centre costs is hugely important for many contact centre’s long term viability. This metric is an aggregate of a number of factors within the contact centre. It is important to understand how attempts to control costs can impact call centre effectiveness and customer experience. In addition, cost is only one factor in contact centre profitability and needs to be used in conjunction with other measures such as (5) below. Agent Attrition. Recruiting and retaining high quality contact centre staff is one of the largest costs for many contact centres. Rising agent attrition means empty seats, additional pressure on existing staff, recruitment time and training. Resulting in an impact your costs and bottom line. Agent Absenteeism. Agents not coming in for their shifts is also a major issue for many contact centres. This may indicate that workforce management needs to be improved. However, the flat structures (with resulting lack of career progression) repetitive tasks and high pressure targets can also be the cause of persistent agent absence. Utilisation. This is a catch all metric that looks at the amount of time that an agent is available to take calls. This can be looked at as a global metric or can be analysed at campaign, team or agent level. This can vary significantly depending on the emphasis on outbound calling. Revenue (or Revenue per call). This is a key metric for many contact centres, especially telesales companies. The most important thing to understand when using KPIs and metrics in general is that they don’t give you answers. What they do is give you areas where you need to ask more questions. It is an invitation to dig deeper in order to figure out the cause of the change in this metric. Naturally, this is important so that you can take the correct course of action, it helps to prevent knee-jerk reactions which can in fact make the problem worse. A Contact Centre Measurement Model (CCMM) is a way to help to structure choosing appropriate metrics to measure your contact centre. For measurement to be effective, it needs flow from the business or campaign objectives. The appendix gives an example of a way in which a CCMM could be structured. To make sure that there are measures across all elements of the work of the contact centre the CCMM are split into the Main Headings for the metrics. For each Focus I have included two Goals which are then measured by an appropriate KPI. For each KPI set benchmark targets can be set. And each KPI can be segmented to drill down in more detail. How often should you review KPIs? You should consider reviewing your KPIs, this is because business conditions and objectives are regularly changing. As a result, the kinds of things that need to be measured will also need to be altered over time. As a rule of thumb, typically, a quarter of business KPIs will need to be changed or amended in some way. Choosing the correct metrics to create appropriate KPIs is an essential task in ensuring that a contact centre is well managed it is to choose relevant metrics. It is also important to consider a measurement model that identifies a selection of metrics that enable all dimensions of a contact centre’s work. Hostcomm’s Hosted Dialler / Contact Centre software provides a huge number of monitoring and analytics data to help you analyse your contact centre performance. In many cases it can provide the metric you need. In other cases with can provide advanced wallboards, call reporting or CRM customisations which can integrate with your back office systems. Learn more about our Hosted Contact Centre or our Predictive Dialler solutions.